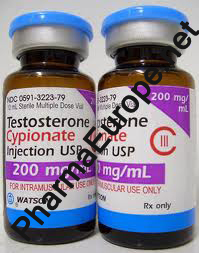 Testosterone cypionate is a long acting ester of testosterone which is increasingly difficult to find. Before the scheduling of anabolics in the U.S., this was the most common form of testosterone available to athletes. 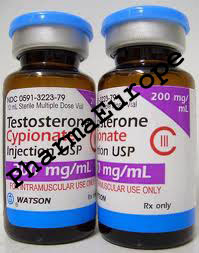 Cyp had gained a reputation as being slightly stronger than Enanthate and became the testosterone of choice for many. Now that anabolics are controlled, this is an almost impossible find. In general, the only versions you'll find on the black market are Sten from Mexico, which contains 75mg cyp with 25 mg propionate along with some DHEA, and Testex from Leo in Spain which contains 250mg cypionate is a light resistant ampule. All versions of Upjohn and Steris in multi-dose vials should be looked at with extreme caution as they are very difficult to get on the black market. Counterfeits are quite easy to obtain. Real Steris products have the inking STAMPED into the box and the labels cannot be removed from the bottle. Any variation of that is definitely counterfeit. A running dosage of test cypionate is generally in the range of 200-600mg per week. When this was available for $10.00 per10ml bottle, many users would take a whopping 2000mg per week. This kind of dosage however, is unsafe, generally not needed and in today's day and age too costly. Usage: Average dose is 200 mg per week.